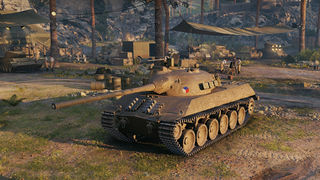 The Škoda T 50 is a Czechoslovakian tier 9 medium tank. The Škoda T 50 leads to the TVP T 50/51. Cannot use a gun rammer, even when not using the autoloader. While the Skoda T 50 has low clip damage, it makes up for it by excellent reload rate and also good gun handling. With Enhanced Gun Laying Drive and/or Vertical Stabilizer equipped, it could aim almost as quickly as it shoots. Its excellent gun depression allows it to go hull down, and combined with the mere 3,6 seconds it takes to unload its clip, it can get away with clipping an enemy without taking a return shot, which is a necessity due to it being prone to receiving crew and module damage. Carrying a large first aid kit is recommended. Although its top speed is somewhat limited at 50 kph (at least compared to other mediums with similar armor), due to its powerful engine, reaching that top speed is not a problem even on a slight incline. All in all, the Skoda T50 is a very capable tier IX medium, and fun to play, capable of severely punishing the enemy for their mistakes, but the same is true for the driver as well. The radio carries over from the T34/100. 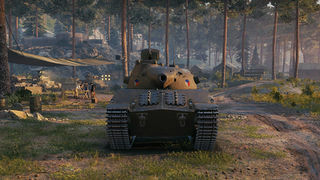 The stock suspension can carry decent equipment, and the extra weight of the second turret is offset by the top gun being lighter, upgrading the suspension is not necessary right away. since it's the gun that makes the tank, first research the second turret, then the autoloader gun. now mount Enhanced torsion bars temporarily, then mount the second turret and the top (autoloader) gun, then the Enhanced torsion bars can be removed. leave the engine last, the stock engine already provides ample power. The radio can be unlocked on the T34/100, but it matters little due to the already decent range of stock radio. Select 2 pieces of equipment of your choice (except for spall liner or wet ammo rack that weighs too much), then mount Enhanced Torsion Bars in the free slot left. Grind the turret, then the autoloader gun for firepower. Grind and mount the top engine. 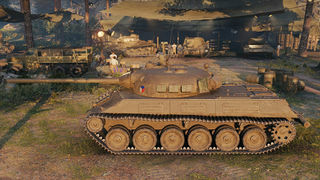 Brings its power-to-weight ratio up to a level that rivals many scout tanks, definitly makes up for the 3rd equipment slot and the agility benefits by researching the suspension early. Research the top suspension, and demount the Enhanced Torsion Bars for another piece of useful equipment. Enjoy your 200k grind to the next vehicle. The manual-loaded 100mm R11 gun costs even more exp. than the mighty top engine, is far heavier than the stock gun, and doesn't carry over to any other tank. It can be skipped or saved for last. Based on the preliminary works on the TVP concept from January 1948, in January 1949, the HQ of the army issued an official request for a tank project to Škoda and Praga. For Škoda, the project had designation T-50 (task 181 B), for ČKD (Praga), the designation was T-51 (task 181 A). The original proposed weight of 35 tons was later increased to 40 tons. Upgunning was also needed and the caliber picked for the final version of the official demand was 100mm (the shell velocity was specified at 845 m/s, the vehicle was to carry 60 to 70 rounds). Further demands included sufficient protection while keeping excellent mobility on the battlefield, air-cooled diesel engine capable of operating under all climatic conditions. Maximum dimensions were set to 6,5m length, 3,2m width and 2,8m height, while clearance was to be 500mm. Armor thickness was set to 65mm frontal, 40mm sides and rear and everything else 20 to 30mm. The hull was to be welded. Secondary armament was set to a 12,7mm AA machinegun (apparently Soviet DshkM) with 1000 rounds, a hull-mounted 7,62mm machinegun and a coaxial 7,62mm machinegun (both were supposed to be newly designed Czechoslovak machineguns with 3600 rounds for both). According to the plan from 1949, the preliminary project was to be approved until 21.8.1949, by the end of 1950 the prototype assembly drawings were supposed to be ready and on 1.3.1950, the first prototype parts production deadline was set. The entire development was to be ready in June 1952. The VTU oversight of the Škoda project was performed by Maj.Ing. Jan Hajšman and of the ČKD project by Cpt.Ing. Albín Třešňák. During the development, other preliminary projects based on TVP chassis were added, such as the TVP ARV, bridgelayer tank, flame tank and mineclearing TVP with dozer blade. The development of most of these project however was not even started. On 27.1.1949 the preliminary project from Škoda and Praga were ordered. 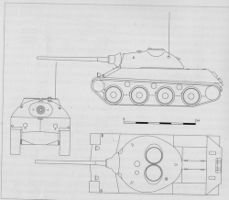 Škoda was to present a tank and cannon drawings and create a 1:1 wooden mockup until 30.9.1949 (ČKD had the same deadline). Apparently, Škoda met the deadline with its T-50 project and presented the entire project in September 1949, including wooden mock-up, but the vehicle was criticized by the attending military staff for tactical reasons: the soldiers complained that the tank is too tall and probably too heavy too. After five meetings held in Pilsen (Škoda) and Prague (MNO), the project was rejected. On 24.11., new proposal was presented and on 2.12.1949, 1:10 mockup of this new variant was created. This variant had a “pike nose”, much like the IS-3, but only a day later (3.12.1949), the soldiers rejected this feature. 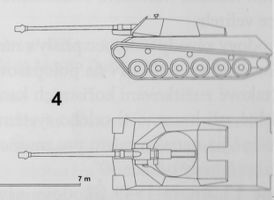 It should be noted that the model of the Škoda T 50 in game does not represent the any of the plans found in archives of the TVP project. Instead, it is based off of a drawing by Czech historian Ivo Pejčoch that represented the Škoda T 50. This drawing is believed to be fake, as it incorporates elements from two different projects. In particular, Pejčoch's Škoda T 50 combines the hull of a TVP-based tank destroyer from 1949 and an enlarged version of the turret of the Škoda T-17 light tank. This page was last modified on 9 April 2018, at 19:17. This page has been accessed 61,194 times.